Broan is still a top choice for anyone who needs a well-performing, but still very affordable, under-cabinet range hood. Need a wall-mounted hood? Kitchen Bath Collection makes our top pick. If your kitchen has an island cooktop, Cosmo makes a high-performance island range hood at a hard-to-beat price. For near ideal blend of performance, style and value, look first to the Broan F40000 Series. 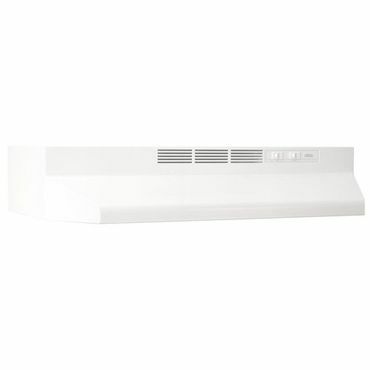 It's a great option for replacing an old hood, and can be used ductless or vented, with installation options to match most existing ductwork. That, along with the F40000's seven color options, including stainless steel, and sizes from 24 to 42 inches, make it a fit for virtually any kitchen. The Broan 41000 Series offers an economical choice for those who just need a simple, ductless under-cabinet range hood. 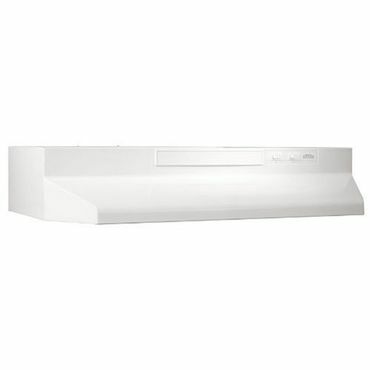 This range hood installs quickly and easily, performs well for a ductless model, looks good, and is relatively quiet. It comes in a variety of widths, from 21 to 42 inches, and in four colors, stainless steel, black, white and bisque. Specs that Matter Fan speeds - 3 Installation - Convertible Speed range (CFM) - 412 max. Owners praise the Kitchen Bath Collection STL75-LED's attractive appearance, terrific performance and great value. 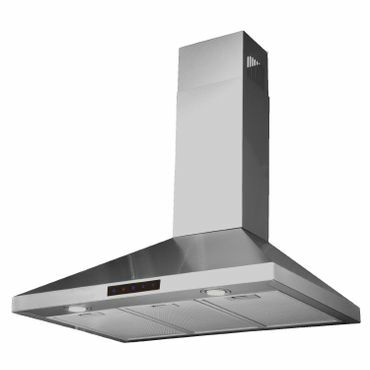 This 30-inch stainless steel wall-mounted range hood can move air at a rate of 412 CFM, more than sufficient for most cooktops and ranges, and provides an array of features including touch control, bright LED lighting and a three speed fan. A 36-inch version is also available. Specs that Matter Fan speeds - 4 Installation - Convertible Speed range (CFM) - 900 max. Powerful, attractive and easy to use and clean, the 36-inch Cosmo COS-668ICS900 is a top choice and a terrific value, owners say, if you need an island-style range hood. This 900 CFM ducted range hood does a great job keeping the kitchen grease- and smoke-free, even when paired with professional cooktops and ranges. It has three fan settings and four LED lights. The removable grease filters are dishwasher safe. A range hood is a necessity in virtually every kitchen. They come in a variety of shapes, sizes, materials and colors, and can cost anywhere from less than $50 to more than $3,000, though the focus of this report is on great looking, excellent performing range hoods priced at under $1,000. What sets the cheapest range hoods apart from high-end models is a combination of function and aesthetics. There are two basic ways to install range hoods: non-ducted and ducted. Non-ducted hoods recirculate the air back into the kitchen after pulling it through a filter to remove, at least partially, smoke and odors. Ducted range hoods use a filter as well, but vent the exhaust to the outside. Ducted range hoods are more complicated and expensive to install, but are also the most effective kind. The most common type of range hood, under-cabinet range hoods, are installed by attaching them to the underside of kitchen cabinets. They can be ducted or ductless. These range hoods usually come in a variety of color options to match any kitchen décor, and a variety of prices too -- although even the top-of-the-line models tend to be more affordable than either wall-mounted or island-style range hoods. Under-cabinet range hoods usually have at least two fan settings and at least a basic, incandescent light. A wall-mounted range hood has a visible vent stack along the kitchen wall and is installed in settings where there are no cabinets above the cooktop. Also called chimney hoods, these units can be very stylish. Virtually all wall-mounted hoods are designed for ducted installation, but some can be converted to ductless use if needed. Island range hoods are similar to wall range hoods, except they look like they are free-standing above a cooktop. Again, virtually all island range hoods are ducted, though many can also be used ductless if needed. When choosing the size of a range hood, under-cabinet and wall-mounted models need to be at least the same width as the cooktop. Island range hoods should be at least six inches wider than the cooktop to help funnel fumes because there are no walls or cabinets to help with the funneling. When comparing range hoods that seem similar in form and function, there are some important specifications and features to watch for. One is power, measured in CFM (cubic feet per minute), which is a measure of the rate of speed in replacing air. The higher the CFM rating, the faster the range hood will draw away smoke and odor from the cooktop. The flip side of the coin is that the faster the range hood moves air, the louder it is likely to be. Manufacturers will often provide a loudness rating, but will use different scales, and that makes comparing noise levels difficult. Among the options, you may see sound levels specified in sones, db(A) or db. But regardless of the scale, user perception of noise is highly subjective. As we observed in user reviews for nearly all range hoods, models that some consider to be exceptionally quiet, others say are exceptionally loud. The bottom line is that while we do present the manufacturer's loudness level ratings (where available) for the range hoods profiled in this report, they should be taken with a grain (or perhaps a shaker) of salt. On the features front, some range hoods have timer-delayed settings to turn the fan and lights off automatically. Others have a timer that lets the user know when it is time to clean the grease filters. Selectable fan speeds let the user adjust the power -- and noise level -- as appropriate. In its free to read buying guide, Consumer Reports suggests using the highest speed when cooking, and a lower speed afterwards "to continue to ventilate the space while eating." The editors add that three speeds should be sufficient, and anything over that is likely to be overkill on the part of the maker. During our research, we found no credible expert reviews of range hoods. Consumer Reports offers a buying guide that discusses brands, but not individual models, and has ceased testing this category. A few other sites appear to offer range hood reviews, but a close examination reveals that all (or at least all that we found) base those recommendations on specs with no evidence that anyone has tested -- or even seen -- the range hoods that they recommend. Because of that, we relied on feedback posted at sites such as Home Depot, Lowe's, Amazon and elsewhere to make our recommendations. That's complicated a little by the fact that many sites include reviews originally posted at the manufacturer web sites and are hence duplicated across the Internet. 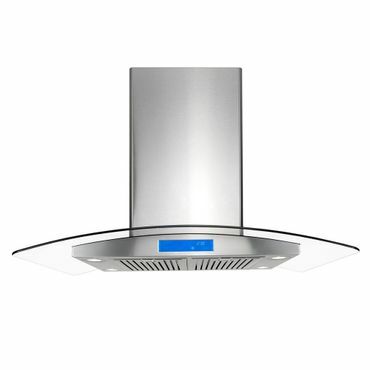 Still, between these reviews and unique user reviews posted at the sites we considered, we found sufficient feedback to evaluate and recommend some top range hoods based on their performance, ease of use and appearance.